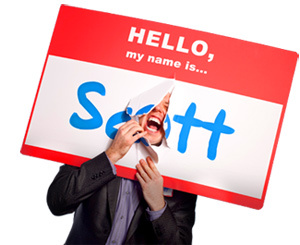 Nine Ways to Spice Up Your Nametag for More Engaging Conversation - HELLO, my name is Scott! Nametags are worn for a variety of jobs and functions, but people don’t like to wear them because they’re annoying, damage your clothing, clash with your outfit, and eliminate anonymity. Conversations like these don’t go anywhere because there’s nothing to say once your have introduced yourself. What if there was something other than your name to write on your nametag? There is certainly enough room on your three inch by four inch plastic tag to add another word or two! The following is a list of nine creative things to write on your nametag that will empower more interesting and engaging conversations. Casinos popularized this tactic years ago to include cities/countries of origin on nametags to create connections between dealers and gamblers. However, any setting in which nametags are worn will engage people to discuss where they grew up. Not only does the nametag promote a conversation about someone’s hometown (which shows a genuine interest in that person and appeals to their self-interests), but the self-disclosure reciprocates and expedites the encounter toward a more detailed interaction. Networking meetings, conventions, jobs or other business gatherings require nametags to identify people with their company or department. But an overlooked addition to your nametag in a business setting is to write what you do, not just your position. Instead of ‘Oscar Meyer,’ write ‘I sell hot dogs to Walmart.’ I promise everyone at the meeting will come up and say hello! Who knows, maybe they’ll want to do business with the person whose nametag made them smile! Picture this: you sit down to a table and notice the nametag of the person next to you: ‘HELLO, my name is Theresa—knuckle cracking drives me crazy.’ Everyone has a pet peeve, and everyone likes to talk (rant) about it! So next time you go to a casual meeting or event, write your pet peeve underneath your name. You will be certain to have some interesting conversations with this one! No matter how boring people can get, you can always talk about food to spice up the conversation. Include such phrases as ‘Cereal works for any meal,’ ‘Kiwi is the best fruit,’ and ‘George likes his chicken spicy.’ It will automatically open someone else up. They will usually smile and ask about your particular food selection. After you answer, you can follow up and inquire about their favorite foods as well. This is great for parties and small group meetings. Most people have some sort of nickname they have been called at some point in their lives. The best thing about nicknames is that there’s always a story behind them. As you discover these fascinating stories, you develop trust, levity and create a friendly bond between two people. After all, if you saw a nametag that said, ‘Laszlo the King’, wouldn’t you want to find out the story behind it? Write down your favorite sport, pastime or interest. Not only does this allow you to discuss something about which you are passionate, but someone else is bound to enjoy the same activities! Who knows, perhaps you will meet your next teammate or book club member! Write your favorite quotation or bible verse on your nametag. This is a brilliant method to encourage conversations beyond the small talk level. Many people have some one-liner, old saying, proverb or verse by which they live their lives—so why shouldn’t we share them? Wisdom like this is meant to be passed on to other people! Get creative and add a number to your nametag. Simply write a number in the bottom corner of your nametag that signifies something. For example, write the number of children you have, miles traveled to the event, number of speeding tickets received, amount of pizza you have eaten in one night, anything! But no matter what the number signifies, people will find out why it’s there. Include the title of your favorite book, album, movie or magazine on your nametag. Because we learn from every connection you make, this addition to your nametag will be a great opportunity to tell people about some of your favorite things. What’s more, everyone has seen one movie, read one book or eaten at one restaurant you haven’t–so use your nametag to spark some future experiences! 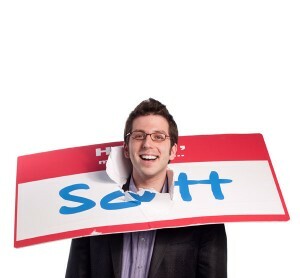 REMEMBER: your nametag can be whatever you want! Think of it as your own personal billboard on which you can advertise anything. If you include additional words or phrases on the nametag, your front porch will become more approachable. Then, you will learn more about new people. You will open doors to valuable relationships. And, you will offer more personal information to make the conversation more comfortable, interesting and fun! Do you remember the last time you encountered a complete stranger who was from the same hometown as you?